Deciding for myself what is best for me. Reacting – and sometimes over-reacting – to the situations around me. Spending my money on me and what I want. Determining my next step without consulting anyone. And then quickly going down that path without stopping to evaluate whether it’s the right one for me. Spending all my time on what I want to do or what I think is best for me. Any of these describe your life? I definitely find myself in these situations sometimes. Do you know how God responds to us when we act like this? 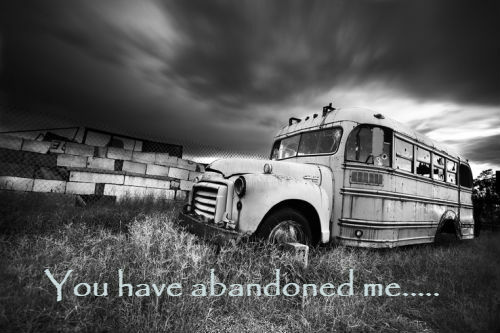 “You have abandoned me; therefore I now abandon you.” 2 Chronicles 12:6. I want to go my own way? He let’s me. Don’t get me wrong – he still loves me. It breaks his heart when I wander away and abandon him in any part of my life. God lets me have this freedom of choice because he wants my whole heart. He wants me to choose him over myself. If I don’t choose to line my life up with his truth, he lets me. And then I pay the consequences for those bad choices. Sometimes very long-term consequences. We share this broken world together so I know you’ve been there. You might be there right now. Saying whatever you want to say when you’re angry – how well did that work? Spending all of your time working. Too busy to spend any time with God. Where did that get you? Spending all your money on ‘stuff’ and finding yourself deeply in debt. Yeah – the consequences of not being obedient with our money are nasty. Stressful. Depressing. And can last a very long time. Because he wants us to learn to choose him over everything else. How are we doing? Where do we need to improve? Or maybe we need to start. Thank you for never really abandoning us, Abba Father.